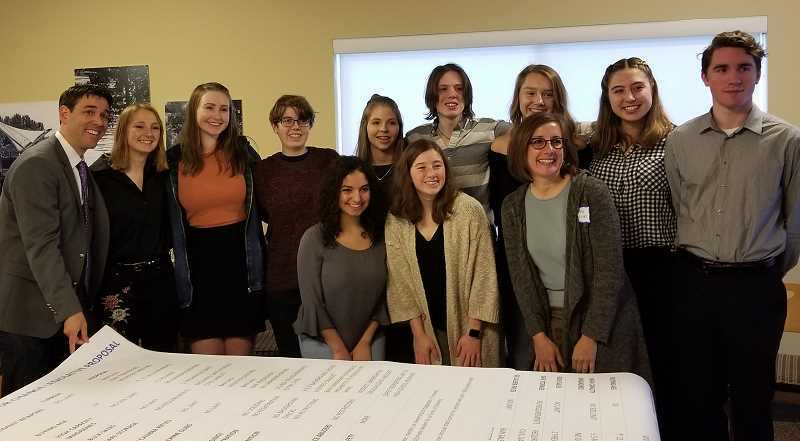 Members of LO Students for Change, the grassroots group formed at Lakeridge and Lake Oswego high schools earlier this year to advocate for school safety and gun reform, presented a 10-point plan Sunday that two Oregon lawmakers vowed to turn into legislation. "I will do everything I can do to make sure these concepts are pushed through," said state Sen. Rob Wagner (D-Lake Oswego), whose daughter, Mia Cremona, was among the student presenters. "We asked you to tell us what you want," he said, "and now we will advocate for you." Wagner was joined by state Rep. Andrea Salinas (D-Lake Oswego), who told the students that "I do this work for Amelia, my seventh-grade daughter, who feels the same way you do." "You are helping to build a safer community," she said. Each of the high school students presented one point of the plan. Robert Vogel, a senior at Lake Oswego High, addressed the specific need to ban assault weapons, but he spoke for the entire group when he talked about what it's like to live in fear of a school shooting. "I just turned 19 last week. I am no expert. I don't know the perfect solution to this issue," he said. "But as I sit in class, I should not be thinking about who I would text, what my last words to my parents would be if, God forbid, someone attacked our school. "I'm 19. I can't buy beer, I can't rent a car," he said. "But I can walk into a nearby Big 5 and leave in under an hour with an assault rifle." "I am 15 years old," she said. "Instead of worrying about geometry, I sit in the library, terrified, because I know that I won't be able to hide in the event of a school shooting, perpetrated by someone who should never have been able to have a gun in the first place." Cremona urged lawmakers to raise the minimum age for gun purchases from 18 to 21, and Vogel asked for a law that would ban the sale and transfer of assault rifles and require the registration of existing assault weapons. "We know what these (guns) are made for," Vogel said. In March, more than 200 local high schoolers brought their pleas for common-sense gun regulations and school safety to Salem, where they met with Gov. Kate Brown, lobbied lawmakers and rallied on the Capitol steps. They also held walkouts and observed 17 minutes of silence — one minute for each of the students and staff killed at a high school in Parkland, Fla. And they joined an estimated 12,000 people in a "March for Our Lives" in Portland as a way of confronting what many see as a nationwide epidemic of gun violence. • Require a license for purchasing or possessing a gun and require that those licenses by renewed every five years. "Licensing laws that require periodic renewal reduce gun crimes by helping law enforcement check that a gun owner remains eligible to possess firearms," Elliott Lloyd said, "and helps facilitate the removal of firearms from people who are no longer eligible to own a gun, such as domestic abusers or those with a criminal conviction." • Require background checks at the point of sale for the purchase of ammunition, limiting sales to licensed gun dealers and prohibiting ownership of ammunition by anyone who is already prohibited from owning a firearm. • Require that weapons be safely stored, with civil penalties for failing to keep guns locked up. Natalie Khalil pointed to shootings in Sandy Hook and at Clackamas Town Center, where gunmen gained access to firearms that had not been properly stored. "Every time a minor shooter uses a gun, it must have passed through the hands of an adult," she said, and those adults should be held liable. • Restrict the sale of high-capacity magazines. "When hunting large game in Oregon, such as deer or elk, there is a limit to five rounds per magazine. This means we have laws in place to stop the mass killing of animals, but not people," said Eli Counce. "High-capacity magazines exist to fire the most possible bullets without reloading. In other words, they exist to cause the most carnage. Why can't we value human lives even as much as animals?" • Eliminate bulk sales of weapons, which Nikki Littler called "an opportunity for firearm trafficking," by limiting purchases to one gun every 30 days. • Ban the sale and possession of machine guns and the sale of 50-caliber rifles, which Danielle Nead-Work called "weapons of war. A 50-caliber rifle has the power to shoot 1,000-2,000 yards with accuracy and can destroy military targets as large as vehicles and helicopters. There is no use for these other than to kill people." •Prohibit the sale of firearms to anyone who has been convicted of two or more drug- or alcohol-related offenses, for a period of 10 years. "This is not a punishment," said Tatum Miller. "This is a way to make sure the person wanting to possess a gun is sober before reintroducing guns into their lives." • And require firearm safety education in high schools. "In health class at my school, we learn the definition of vitamin B12 and the in-depth details of why we should drink water and not soda. But we are never taught about gun safety," said Natalie Goldberg. "We deserve the tools to help us stay alive." Salinas told the students that she and Wagner hoped to have something drafted and ready to show colleagues as early as September, with the goal of having a bill or bills ready to introduce in the 2019 legislative session. That sounded good to Vogel, who pointed to gun regulations recently signed into law in other states. "We must follow suit," he said.